INDIANAPOLIS -- An Indianapolis student who was stranded overseas after he severely injured his back has made it back home. 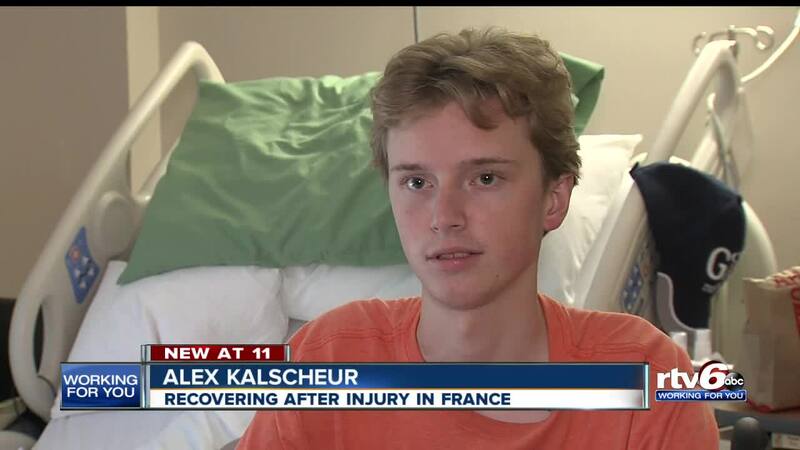 Alex Kalscheur, 18, fell 30 feet from a wall while stargazing when he was visiting a friend in France. The fall broke two vertebrae in his back. After a GoFundMe page raised tens of thousands of dollars, Kalscheur made it home. But his recovery is just getting started. His intense rehab can cost up to $5,000 per day. The process could take as long as two years. "I could heal from now until 2020 and still not be able to walk, but it's kind of a wait-and-see kind of thing," Kalscheur said. "I would love to be able to dance again." If you’re planning a trip outside of the U.S., you should always check in to purchasing medical Evacuation Travel Insurance before you go. The prices vary, but the insurance can help cover the cost of a medical transport if you are seriously injured while out of the country.